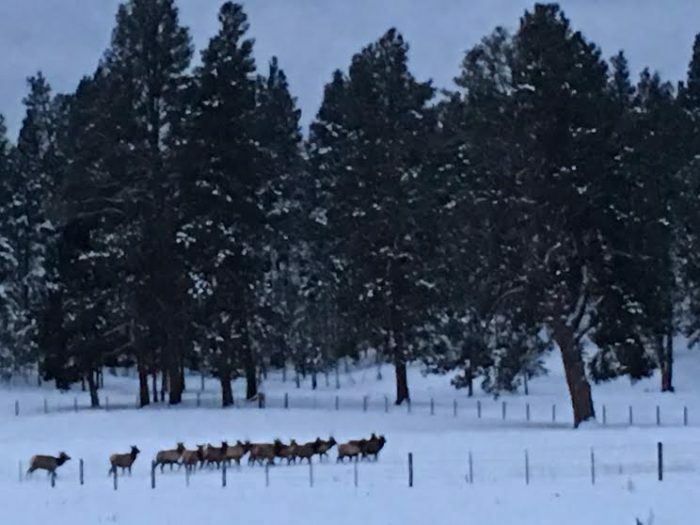 It is the middle of December and I never imagined that I would be writing about filling my elk tag in this column during this time of the year. Fill my elk tag is exactly what I did last weekend as frigid temperatures and snow hit Montana. Arlyn Lemer and Paul Rossignol from Lolo, Steve Hellegaard from Missoula and father-son Randy and Rainier Batt from the Frenchtown-Huson area joined me for an elk hunt. The hunting opportunity was the result of the elk shoulder season that is now in effect in many of the 43 hunting districts in Montana that were earmarked for the elk shoulder season. As you might remember earlier this year, Montana’s Fish & Wildlife Commission approved elk shoulder seasons in 43 hunting districts for the 2016/2017 hunting season with the primary purpose being to reduce elk populations in areas that are over population objective as outlined in the Montana Elk Management Plan. A shoulder season is a firearms season that occurs outside the 5-week general firearms and archery season on private land. This elk hunting trip is the first elk shoulder season that I have had a chance to participate in and I am happy I did because it put meat in my freezer. The month of November for me was not very productive for elk hunting. Not only did I not fill my elk tag but I didn’t even see any elk in the area that I had success hunting elk for years, mainly because of the mild weather during the month of November. So when we decided to go elk hunting last week I looked at the weather forecast and it called for sub-zero temperatures and snow. The uncomfortable weather conditions didn’t matter to any of us because we had a good idea that the change in the weather might get the elk moving and we were correct, it did. I was also curious on what it would be like hunting during the elk shoulder season. Would the experience resemble the general elk hunting season or would we see 500 elk standing out in an open field or by haystacks much like a damage game hunt. Even though all of us were successful in filling a tag the hunting experience was like hunting elk during the general rifle elk season with one exception. Our shoulder season elk tags were only good for harvesting cow elk not bulls, so it wasn’t a trophy hunt unless you consider filling your freezer with elk a prize like I do. The first afternoon we shot two elk but the next day we only saw four elk and they were out of gun range. The final day of our trip started out slow but around mid-morning we decided to walk a patch of timber and just like that our tags were filled. So just like the general season there was spotting, stalking and shooting involved in our hunting experience. So as far as I am concerned both the general and shoulder seasons hunting experience were the same with one exception. Thanks to the elk shoulder season hunting opportunity I now have meat in my freezer.